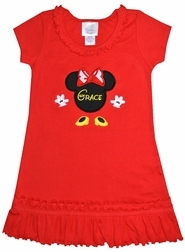 We love this simple and adorable cotton red dress for little girls perfect for trips to Disney and Disney parties. The dress is made in a simple, flowing aline style, has short sleeves and is embellished with a ruffle around the neck and horizontal ruffled red fabric just above a big red ruffle at the hem of the dress. On the front who do we have?? 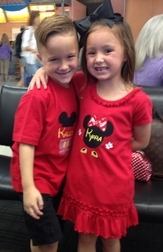 Well of course it is Minnie with a red chevron bow, her white gloved hands and yellow high heel shoes! 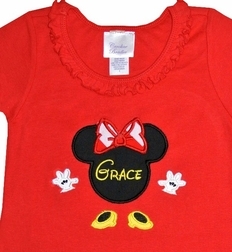 Your little one's name is monogrammed inside Minnie's head in yellow.